In North Campus, all roads lead to Hudson Lane. With several cafes which are easy on the eye and the pocket, it’s everyone’s favorite adda. For those of you who can’t quite find your way here, LBB brings to you a handy guide to the road of wonders. A rooftop, fairy lights and good food: You really can’t go wrong with that combination. Go for the Virgin Mojito, Peri Peri Chicken, and the classic brownie with ice cream. Their Chinese options are all-time favourites that we continue to go back for, especially the dry garlic chicken. The tandoori starters are good too, but you can pass up on their rolls and wraps. A pure vegetarian restaurant with great service and great music. We love the nachos chaat, Amritsari Paneer and the Dum Aloo. Also, get your money’s worth with student discounts. Just show them your college ID and score good grub on the cheap. With a name as cute as that, we hoped we wouldn’t find much to complain about here – and we didn’t. The window display alone will have you drooling. Try their tiramisu, blueberry cheesecake, and the Chocolate Indulgence Pancake. Though on the slightly more expensive side, Big Yellow Door, QD’s and Rico’s most definitely live up to their reputation. 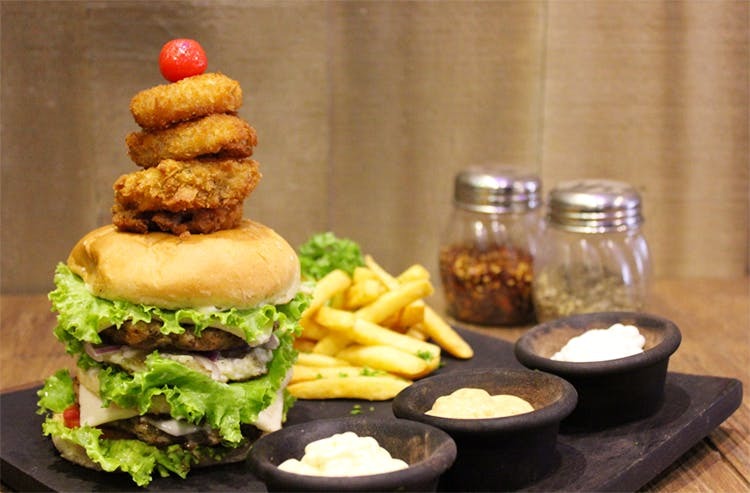 Each has its specialty – the BYD Burger, the QD’s Tandoori Momo, and any dessert from Rico’s (but especially, the Banoffee waffle). Apart from these, try out QD’s north Indian food, and Rico’s Risotto Balls, Nachos and mocktails. Though not exactly on Hudson Lane, we couldn’t leave Mr. Crust out of this guide, because if you’re anywhere near this place, you need to drop in and sate your sweet tooth! Their chocolate mousse, toffee walnut pie, and carrot cake are all to die for. Its quirky décor and quick service has made this Hudson Cafe very popular over the years. We recommend the Mushroom Bruschetta, and the Peri Peri Pasta. The desserts are worth a try too; stare at the feminist wall art as you finish your meal. A venture by the OG Hudson Lane and Satyaniketan Restaurateurs (see — QD’s, Rico’s, Cafeteria & Co.) opened for business a few months ago, and we went to check it out. The restaurant promised all-day live music and delicious food, and we weren’t disappointed. Try out their Mushroom Chargrilled Skewers, Peri Peri Chicken Tikka Skewers, Penne Arrabiata, The Great Indian Vegetarian Platter, and Hummus with Pita. We'd be remiss if we didn't put these guys on the list. Cafeteria & Co. seems to do anything they make or bake complete justice. We love the star burgers, hexizza, and the crepes here, but you could very well close your eyes and point at a menu item randomly and you'll end up delighted. Bringing popcorn out of the cinemas and on to the streets, Popcorn & Cola's Hudson Lane outlet has flavours and fusions we found unique. We loved the Cheetos flavoured popcorn (took us back to our childhood), the Maggi masala popcorn, and the Cola Ice Pop–a mix of ice cream, chocolate popcorn, and soda. With inputs from Tushar Thapar.